We can drill and glue reinforcement bars and threaded rods in order to connect individual constructions. 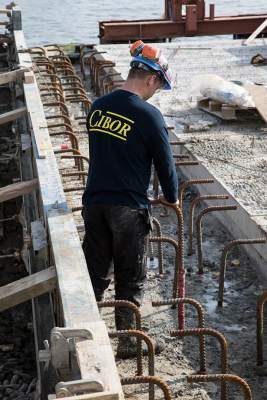 Cibor guarantees highly accurate work, based on the latest techniques, as well as extremely reliable results. 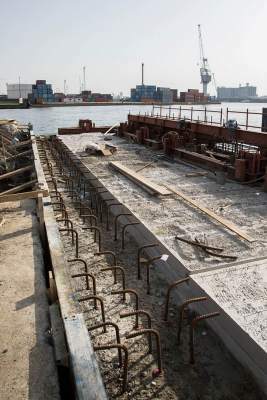 If necessary, we can also calculate and test the maximum anchor load beforehand. Mechanical anchoring involved anchoring via cotter bolts and other tensioning anchors. This method of anchoring is fast and offers high tensile strength, which ensures high reliability. Mechanical anchoring can sometimes be insufficient. In such cases, a chemical anchor is usually the answer because it often offers higher loading options. Chemical anchoring is carried out by mixing two chemical components. The anchor attachment then becomes rock-solid and is often stronger than a mechanical attachment, and is subject to zero stress. Cibor can drill the required holes and also take care of anchoring. Our speciality is installing heavy-load anchors. This was demonstrated by an anchor point on a 60 metre-tall chimney stack at a petrochemical company in Antwerp, using M4 threaded rods and a set depth of over 1 metre. Do you want to anchor certain constructions? Then discuss your wishes with one of our experts on 014 570 340 or send us an e-mail.